Everyone’s at it. You can tell that the international merry-go-round of ready-to-wear shows are almost upon us (New York kicks it all off on 7th Feb) when there’s a rush to garner attention for designers’ pre-collections. The Pre-Collection is a taster for what’s to come in the oncoming show. It sets up a market for the goods, so to speak, allows the designer and brand to see which pieces are gaining most attention from both buyers and press and allows for little twists accordingly to the main collection, as well as orders to rush in. 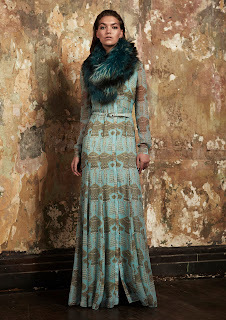 And with that, for Pre Fall’13, Williamson has gone all Nordic Folk culture on our asses. He manages to combine his house aesthetic for tripsy Bohemian cultural influences with a deeper hue involving digital graphic prints and fresh colour combinations drawn from glacial lakes and Scandinavian pine forests. Williamson has concentrated on daywear as much as he is known for his flamboyant evening wear. Dress silhouettes are modern and flirty with godet details create fluted hems, and soft twisted knots in chiffon and crepe – reminiscent of wrapped huntsman’s rope. Tailoring highlights the female form with patch-worked diagonal chevrons, and folk-inspired yoke details highlighted with delicate cord piping. Swan-necked collars are finished in hand crafted leather blanket stitch detailing, and soft lantern sculptured sleeves add volume to clean lines. There are Swarovski encrusted necklines and shift dresses that shimmer and throw light with movement. To finish and add another layer, traditional ethnic jewelled adornments drape the body in diaphanous sweeps of colour. Not bad for a Pre-Collection. Looking forward to seeing the catwalk show up close and personal. Previous post: Raf’s Spring ’13 vision at Dior – But is it Couture?